The cover of this book caught my eye and I’m glad to say that it was worth every minute I spent reading it. 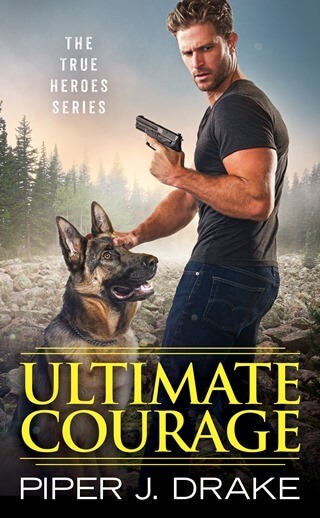 ULTIMATE COURAGE is a very sweet, heartwarming and engaging story of strength and overcoming obstacles, with very enjoyable characters whose personal struggles and the development of their relationship as well as the suspense completely drew me in. While the first book in the series was an okay read for me, this book had me very excited and I’m looking forward to the next book in the series. Elisa Hall has been on the run from her abusive ex for quite some time but with the resources at his disposal it’s like fighting a losing battle, until a chance meeting brings her to a place where she finds a sense of belonging, support, and protection that have eluded her for so long. Alex Rojas is struggling to put his life back together but dealing with his PTSD is a daily struggle and his daughter and his job at Hope’s Crossing Kernels leaves him with little room in his life for anyone or anything else, but he can’t resist anyone in need and from the first glance at Elisa, he knows that he’ll doing anything to make her feel safe. From the very first meeting the attraction between Alex and Elisa was very obvious, but I loved that there was no rush to take things to the next level. Between Alex’s PTSD and Elisa’s trust issues, they both had major hurdles to overcome and I enjoyed the slow and mellow pace of the story as they learned to let down their barriers and open up to each other. Alex was very patient with Elisa, which was so very sweet and I liked that his friends accepted Elisa without any reservations and were willing to help him protect her. I’m admittedly not a dog-lover, but Souze was also a very appealing and central part of this story. The story is very much on the slow side, but I think Ms. Drake does a good job building up the tension and suspense all the way to the end. While the timeline of the story is short, it does not feel that way because there is so much drama crammed into that little time. Elisa and Alex are a very delightful pair, Alex’s daughter is adorable and their friends are great secondary characters. The ending felt a little rushed and I wish there had been more to the story on the ex and his activities, but I still enjoyed it. This is a book that would appeal to animal lovers or anyone looking for a slower paced suspense and I highly recommend it.